The Foundation is named for Ashintosh Macopenjy, the ships doctor for the HMS Endeavour. When the University of Queensland Medical Society (UQMS) formed in 1936, Dr Macopenjy was chosen as its official mascot. 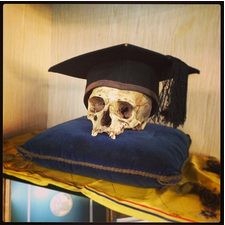 The UQMS is now in possession of Ashintosh's skull, proudly on display at all general meetings. Teddy Bear Hospital - is one of our longest standing and most successful projects. UQ medical students visit primary school students to promote healthy eating, exercise, sun safety and oral hygiene. The Queensland Medical Orchestra (QMO) and Queensland Medical Choir (QMC) are comprised of medical students, doctors and other health professionals from around the state. To find out more, please visit their website. The Queensland Medical Jazz (QMJ) is also comprised of medical students, young doctors, and other health professionals from around the state. The Ashintosh Community Development Grant Program: Providing funding to support the charitable endeavours of medical students. Coffeehouse - an acoustic music evening with live medical student musicians and barista quality coffee. It both raises funds for our community work as well as proving a casual atmosphere for students to get creative. Jazz - QMJ now runs two major events a year. They are a great excuse to dress up, raise money for charity and dance to some smooth tunes.